Description of "International Journal of Research November 2015 Part-1"
We are happy to announce the successful publication of the November Issue of the International Journal of Research. We encourage graduate, post graduate, PhD students and other scholar from the field of science, technology, planning and management to get their paper published and share the treasure of the knowledge that you have gained. To fulfil the aim and objectives of the Open Access Journal. We have made our content freely available for researchers and scholars to access and enhance their knowledge. 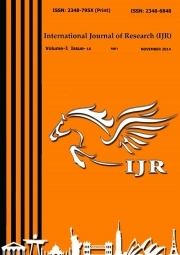 Reviews of "International Journal of Research November 2015 Part-1"